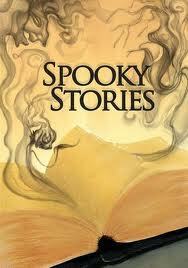 It is almost Halloween, which means in the U.S., it is time for SPOOKY STORIES. Spooky stories are fun, and a fine opportunity to practice skills of description, elaboration, and plot development in a novel way. It is also, particularly for older students, a chance to help them distinguish between artfully created suspense and gory excess. Perhaps it is time to watch a little Hitchcock or read Edgar Allen Poe. Analyze what makes good scary stories frightening. It is both critical literary analysis and preparation for students’ own writing. Personally, I prefer requiring bloodless scary stories. They challenge students to summon fear without endless entrails—definitely my preference when I’m going to read a class set! But with or without blood, here are some guidelines for creating spooky stories with real chills. You might want to start with a Spooky Story Game to get students warmed up and help them think about the kinds of descriptive vocabulary that make spooky stories a success. Here some other key ideas/decisions to share. They could easily be adapted into pre-writing activities at a variety of grade levels. Spooky stories need a spooky environment. This doesn’t mean they all have to take place in a haunted house. Think about what might make other places feel spooky. What might a spooky garden be like, or a spooky school? Where will the story take place? Spooky stories need at least two kinds of characters—someone to be scared, and someone (or something!) to scare them. Think about both kinds of characters when planning the story. Again, scary things aren’t just ghosts or zombies. The scariest characters in The Birds are creatures we think of as pleasant under most circumstances. Good scary stories have a plot that gives the main character a problem, and then builds suspense as he or she tries to solve it. Tension grows as characters try one thing after another without success, or run into more and more mysterious things. 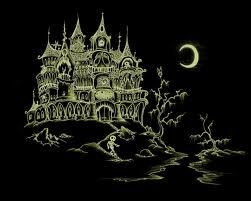 A good spooky story is seldom a straight line. It is more like a meandering path through the woods. Students will need to think about the key problem in the story and how it will evolve—and eventually be resolved (or not, if you want to leave room for scaring-yet-to-come). Sometimes it is possible to plan all the plot twists and turns in advance, but often they evolve with the story. Still, the key conflict needs to be clear from the beginning. The story needs a beginning, middle and end—and each of them should be scary. Think about how to catch readers’ attention at the beginning and give them a clue that scary things are to come. The middle is a good place to practice foreshadowing—planting clues about how the story will evolve. Of course more sophisticated writers may plant “false” clues as well, just to add to the mystery. Would you like to hear some scary stories, just to get in the mood? The Moonlit Road website has tales from the American South, including a number where you can hear storytellers recounting the stories. Perhaps they will inspire your students to tell stories as well. The American Folklore website also has scores of stories read. In this time of year when things get darker and thoughts turn to things spooky, enjoy the chance to invent tales. We’d love to hear about them! « Creativity and Dropping Out—Can We Stop It?